For future reference, the number to call with in case of any issues with the postal service is: 01647 24440. Thank you to everyone who came to Burrington Primary Schools PFA's Ferret Racing Night. 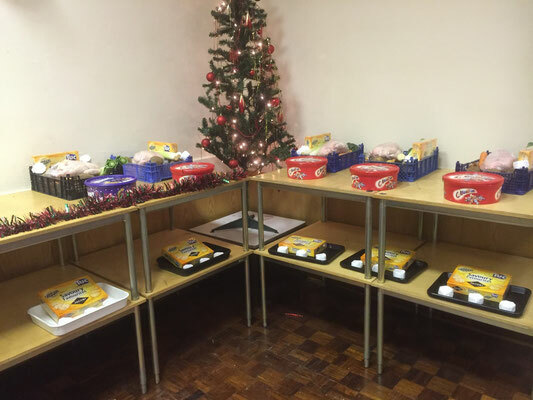 We raised a grand total of £684.94 for the school which is a fantastic amount. Without the help and generosity of so many people this evening would not have been able to go ahead so thank you to everyone who helped and a BIG thank you In particular to Terry and Rose for bringing along their fantastic ferrets, Roy for sorting out and helping man the bar on the night, Stuart for great commentating and to Kay and Pauline for helping out on the tote we really did appreciate it. 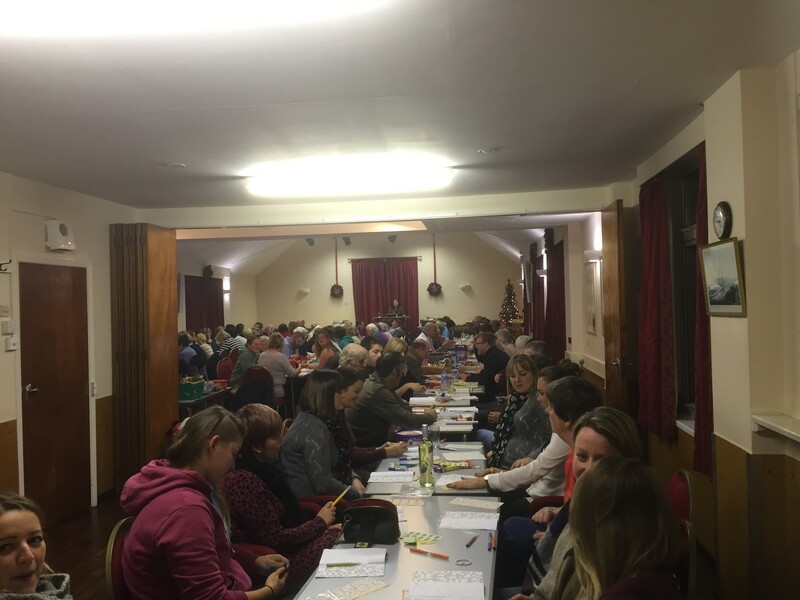 The Burrington Christmas Bingo was attended by record numbers, players of all ages enjoyed a great evening with excellent prizes. All proceeds to the village hall, a whopping £704!! Do pop in to see what we have in store. We will sell everyday needs, plus a few specials, all at competitive prices. As many as possible locally sourced. If we don’t have what you want, let us know and we will do our best to help. A record number of players swung into action this year for the annual Golf Fun Day. Amongst the number this year was three juniors who played for the first time. All were mentioned at the dinner Tom Pearce for his driving and putting on the 13th, Max Bonner for his driving and putting on the 5th which resulted in a team birdie on that hole and finally Holly Bonner who on the 12 did a 50 metre chip onto the green and then putted out the 8ft. The weather was glorious and the refreshments at the 9th tee were welcomed by the teams, with the buggy ably driven by Tracy Ford, who caught up with the teams again on the 15th tee. The day ended with a dinner and presentation of the prizes in the club house in the evening. In 1st position were Nigel Ford Kay Elworthy Robert Short and Tom Pearce. 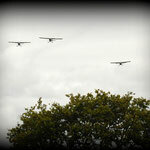 In 2nd position on count back were Roger Snell Jacque Tett Richard Elworthy and Max Bonner. On the green nearest the flag in one Shot on the 3rd was won by Pauline Down. On the green nearest the flag in one Shot on the 11th was won by Graham Short. Nearest the Pin in 2 on the 9th was won by Chris Snell, Sue Ley, Sue Short and Andrew Bonner (scoring an Eagle). The longest drive for the Gents was won by Chris Snell and for the ladies by Jenny Herniman. Nearest the black and white post from the tee on the 14 was won by William Elworthy. 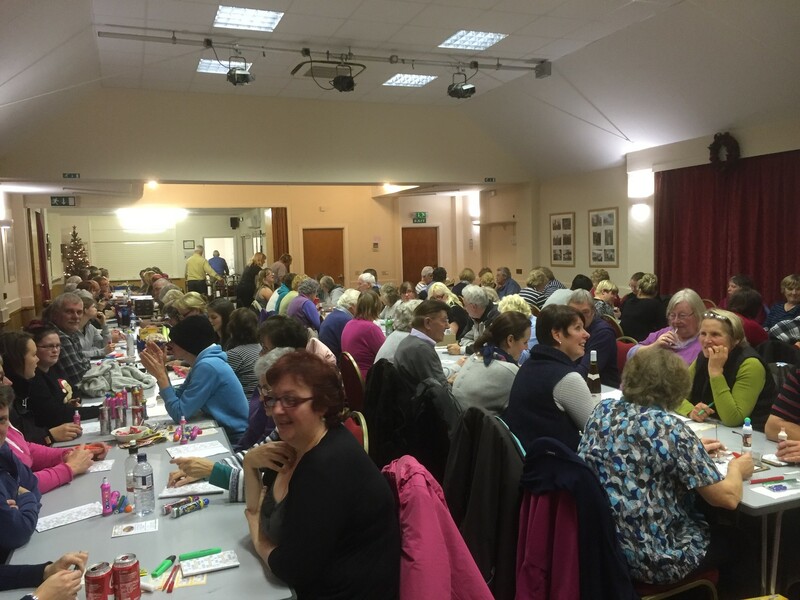 Thank you to Libbaton for hosting the event, and for the excellent evening meal. Burrington is a small rural village in North Devon, with a population of approximately 500. 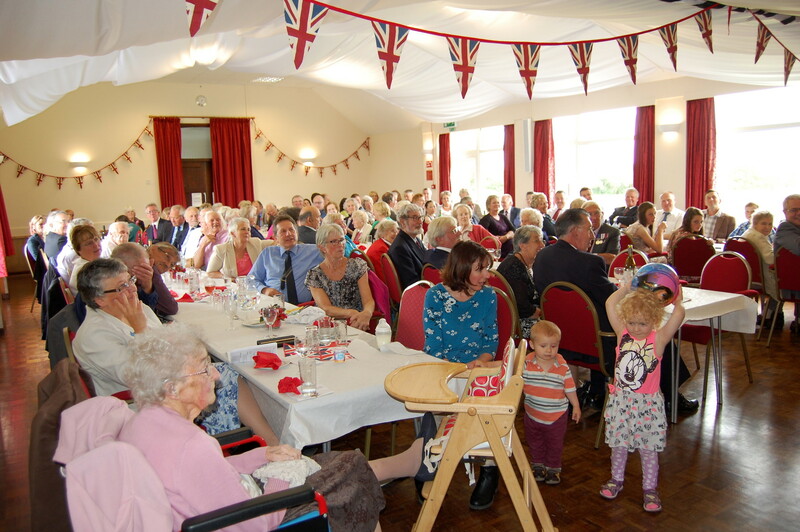 On Sunday 16th August a Service of Remembrance was held in the Parish Church, followed by a Lunch, organised by local volunteers, in the Parish Hall. 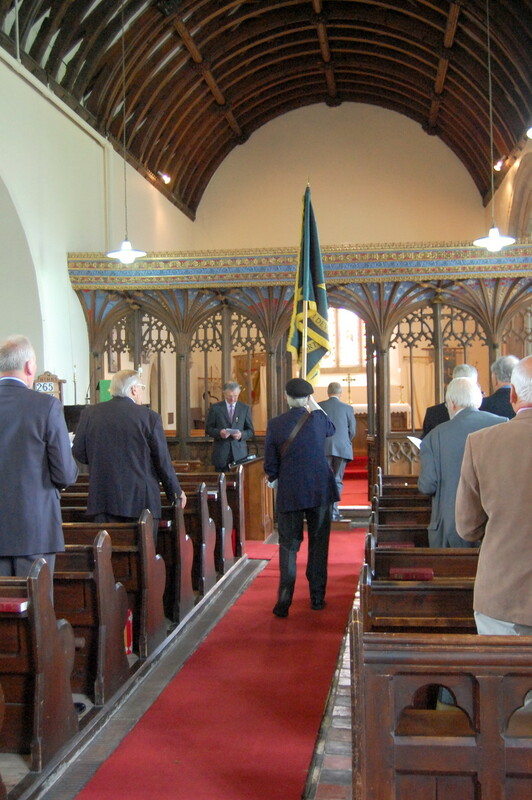 The Service was attended by the British Legion Officials a Bugler Mr. Albert Hall, the Burma Star Banner was held by Mr. John Hayes “a friend of Burma Star”. 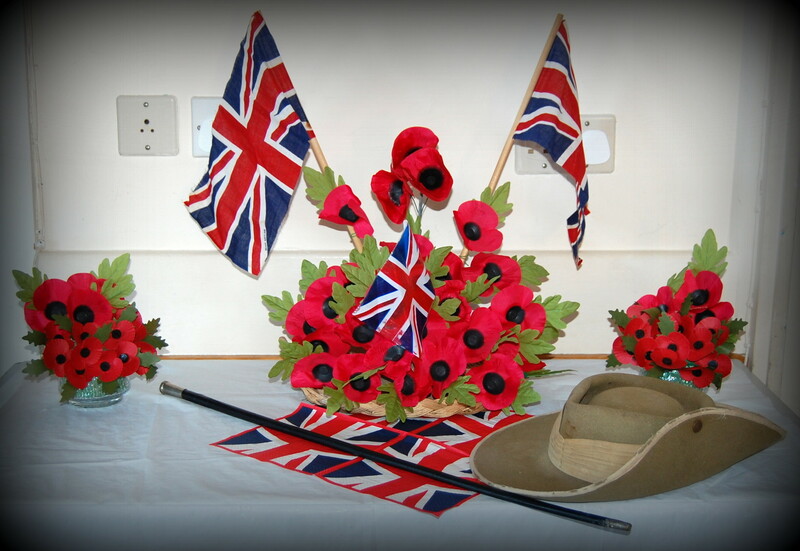 The exhortation was said by Mr. Antony Sharpe (retired Lt. Col) and the Kohima Epitaph was said by Gordon P Short who served with the 4th Btn Royal West Kent, at the “D.C’s Tennis Court Battle of Kohima” accompanied by Victor Mock who served with the 1st Btn Devonshire Regt at “the Siege of Imphal”. Poems were read by Mrs Susan Bailey and the address, which included “the Story of the Pack of Cards” was given by Mr. John Chapple. 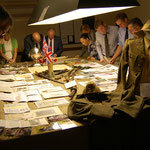 Over 120 attended and the collection taken in aid of the Heroes Return Charity and amounted to £440.00p. 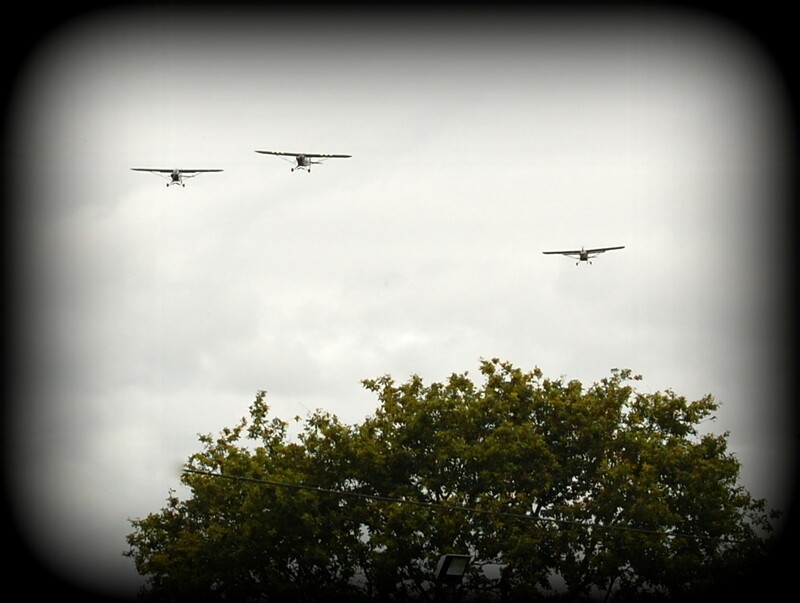 A flypast of three vintage planes (one from the Burma Campaign) passed overhead as the parishioners and friends made their way from the Church to the Parish Hall for a lunch. 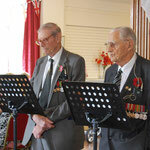 During the lunch Mr. Victor Mock and Gordon Short, gave brief reminiscences of their wartime experiences. 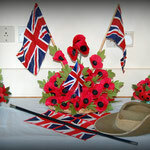 Unfortunately the time was limited because; the members of the British Legion and our two surviving Veterans had to leave to attend another ceremony at the Cobbaton Army Museum. 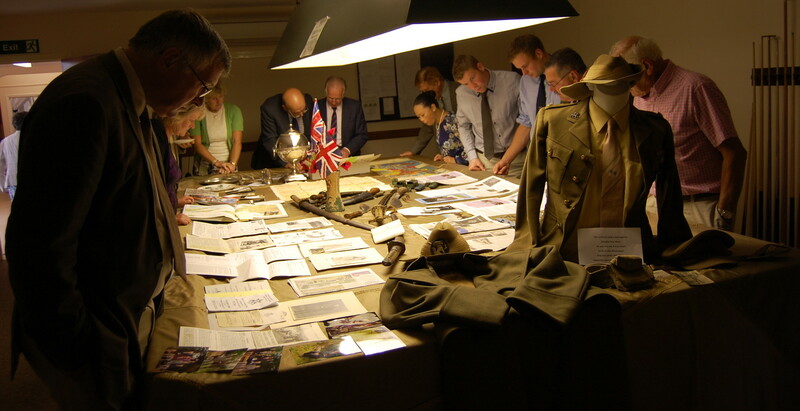 Japanese Swords and Kukri’s given or lent to the Barnstaple Museum, were on display and laid out with other magazines, maps, rail tickets, photos and papers that had survived the years. These were available to look at in the hall after the lunch. 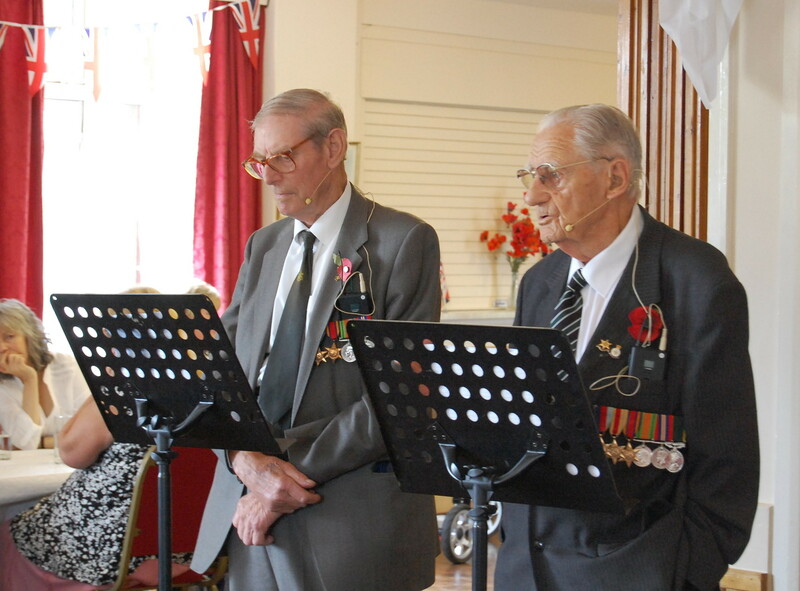 Victor and Gordon were two of the only five surviving Veterans in North Devon, fit enough to attend the memorial Service organised by the British Legion in Rock Park, Barnstaple on the 15th August. 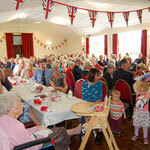 The proceeds of the lunch, after expenses, were £920.00p. We are in the process of trying to establish more about the history of Churchlands, so would like to take this opportunity to add a photo please to see if it prompts a response. We have lived here for the last 6 years and have been slowly renovating the property. We are located down by the river, between the garage at Fortescue Cross and Hansford House, tucked away. 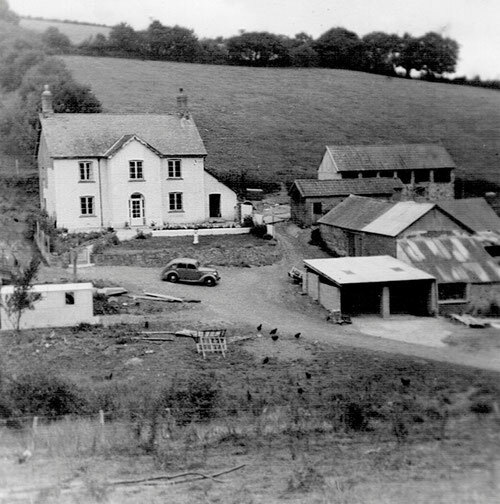 Parish and census records have helped us established occupants going back to the 1840’s but we are still no further with a date of construction – we are pretty sure that the property was built on the site of an old farm and while it has been called Churchlands farm for some while, started life as Churchland. It’s an unusual rural property and in design more in keeping with an old manse or vicarage. The above photo was given to us recently by Wendy Downing, who was born here and is from the 1950’s. We have had many visitors over the years who have had a link to Churchlands, normally holidaying when the property was rented out – and the owner staying close by in a caravan. We hear tales of donkey rides up to the village, people generally loved the place being sheltered and quiet and close to the water. It has been brought to the Parish Council’s attention that there have been several incidents of dog walkers failing to control their dogs when walking on the Public footpaths around our Parish. So please heed the advice below. a field and always under close control please. The NFU produces a useful leaflet called 'Worrying of Livestock by Dogs'. Advice can be found on the National Farmers Union Office website. There are six sections of The Countryside Code dedicated to helping members of the public respect, protect and enjoy the countryside. to protect it, other animals and people. Burrington Parish Council have provided four dog bins. The person in charge of a dog, whether they are the owner or not, must by law (under the Clean Neighbourhoods and Environment Act 2005 ) clean up after the dog has fouled in any public access areas. This includes car parks, grass verges, recreation and sports grounds, parks, river walks, pavements and footpaths, gutters and carriageways, beaches. Failure to do so can result in a fixed penalty of £75 or a maximum fine of £1,000. If you witness a dog fouling incident, please report it to us through the online form available on the North Devon Council Environmental Health page. You can also download a copy of our dog fouling report leaflet. As a key stakeholder I’m writing to inform you that we expect to announce a series of urgent and necessary measures to address a worsening of the CCG’s financial situation shortly. As you may be aware, last year the CCG returned a £14.5 million deficit (known as the control total) and this year we have been predicting the same. Our confidence in meeting the control total at the end of year has gradually declined as the situation has become clearer; in short, demand for services is outstripping what we can afford. Whatever the actual cause of the increase in demand, it is having a serious effect on the financial position of our own organisation – and if we fail to do deal with it now as the area’s main commissioner, services will suffer. We must act to protect essential services through our busiest winter months and ensure that care is there for our patients when they really need it. The CCG has already begun to implement a series of measures designed to improve efficiency in the system and encourage patients to contribute to improving their own health outcomes. These measures bring the CCG into line with similar organisations in the NHS. However, they are not enough. We agreed that the organisation would work up a series of measures that would prioritise those patients most in need, while at the same time, increasing efficiency in the wider system – and the CCG itself. Our clinical chairs and managing directors are now busy working up proposals, in collaboration with NHS England and others, so that we can submit a paper to the next Governing Body on November 5. This paper will be published on the CCG’s website on October 29 – 7 days before the meeting. Throughout the implementation of our ‘in-year’ plan we will be prioritising those services and requirements laid out in the NHS Constitution. To meet the challenge of prioritising patient need while at the same time meeting our control total, the Governing Body will be asked to temporarily change how we work. We are intending to split our management and administration resource between ‘business as usual’ and ‘in-year priorities’. Finally, just a reminder that the Governing Body paper detailed the proposals will be available on our website www.newdevonccg.nhs.uk from October 29. I will, of course, be happy to answer any queries that you have. For all local news and events,the Burrington Community Magazine Magazine is available at £5 a year, please send cheques payable to Burrington P.C.C. to Margaret Bolt, Week Farm, Burrington, EX37 9BW. 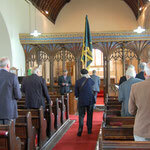 The magazine can be collected from the village shop or the Church . A Dementia Friend learns a little bit more about what it’s like to live with dementia and then turns that understanding into action – anyone of any age can be a Dementia Friend. From helping someone to find the right bus to spreading the word about dementia on social media. Every action counts. If you are interested in becoming a Dementia Friend and joining a national initiative that will help people living with dementia feel included in their communities, we can arrange for an information session to be run here in the village. The session lasts around one hour. You will learn more about dementia and how you can help to create dementia friendly communities. If you are interested in being part of this important national initiative please contact Susan Bailey, Meadow Park on 01769 520413. We need a minimum of 6 people to run this course. As soon as we have the minimum number of people we can fix a date for the Dementia Champion to run our information session. Just a reminder that everyone can report faulty road surfaces directly to Devon County Council. It is quick and easy to do using the link below. With the winter approaching it would be good for the roads to be in good condition.